Renowned for many excellent restaurants and neighbors vs tourists, Ojochal is a preferred community for a laid-back and tranquil lifestyle, where the mountains meet the sea. This charming house with 2 bedrooms is located at the end of a quiet road in the quaint village of Ojochal, with an outstanding wide mountain view, yet only 10 minutes to two beaches. Gain access to the property through an iron gate with beautiful details, traveling a long driveway which sets the house back nicely from the road for privacy. The property is landscaped, with many palms, flowering bushes, cactus and maturing fruit trees. 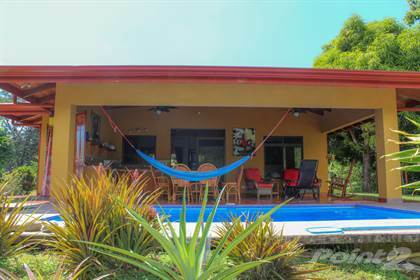 The house is designed to maximize the outdoor living lifestyle popular in Costa Rica, with outdoor kitchen, dining and lounge spaces. The smaller terrace is a screened dining or games area, overlooking fruit and flowering trees in the front yard. The spacious rear terrace runs the length of the house, overlooking the pool and expansive mountain view, with a kitchenette, and the primary dining/lounge area. The mountains bring fresh, cooler breezes morning and evenings. The large saltwater pool benefits from afternoon shade cast from the terrace. The interior of the house features 2 bedrooms, a bathroom and kitchen with an island. There is a multi-purpose room accessed from outside which houses the laundry, half bath and storage area. A shower is handily located just around the corner from the pool. This property is turnkey. The furniture, appliances, household items, and linens are included. Ocean view acreage with easy access - 1.3 acres. 0.62 ACRES - 2 Bedroom Affordable Home With Pool In Ojochal!!! Hi, I'd like to find out more information about Two Bedroom House with Expansive Mountain View. Thanks so much!